The Boston Symphony Orchestra was a television pioneer. More than 150 live concerts were broadcast by the Boston TV station WGBH between 1955 and 1979. ICA has taken on the task of making many of these performances available on DVD. 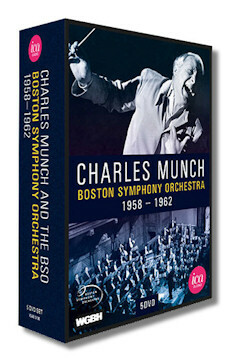 This box collects a series of performances with Charles Munch at the podium, all recorded at Harvard University's Sanders Theater. The sound quality is variable and not all of the performances are equally satisfying, but the best performances here are truly memorable and the collection as a whole is an important historical document. Charles Munch, who was himself French, is probably best known today for his recordings of the French orchestral tradition, with a particular affinity for Debussy, Ravel, Berlioz, andSaint-Saëns. But on this disc we have something completely different, with a range of composers who do not typically come to mind when Munch. The collection features a Haydn symphony (No. 98), two Mozart symphonies (No. 36, the "Linz", and #38, the "Prague"), two Beethoven symphonies (Nos. 4 and 5), Schubert's 5th, and Schumann's 2nd, in addition (stunningly) to Bruckner's 7th and Mendelssohn's 4th and 5th (the Scottish and the Italian). Brisk conducting is a common thread through all of these performances. Bruckner's 7th is dispatched in a little over 50 minutes, for example. For comparison, relative few performances come on at over 60 minutes. At its best this can be exhilarating. Munch's tempi are very successful in Schumann's 2nd, where Munch and the BSO deliver a blistering performance of the first movement and a rousing finale. The Allegro vivace first movement in Beethoven's 4th is vivace indeed and the searching and well-paced finale in that symphony is an excellent bridge to the scherzo and finale, which are taken at a racing pace. The two Mendelssohn symphonies lend themselves to Munch's pace. But at times Munch's addiction to speed is his undoing. The Bruckner 7 performance is really rather disappointing (although the orchestra and audience seemed pleased enough). It would have been interesting to hear how a conductor as rhythmically precise and sensitive to details of orchestral color as Munch could perhaps shed new light on the symphony. But there's little time in the sprint to stop and smell the roses. To my ear the finest performances here include Haydn's 98th, which Munch takes in a more Romantic vein than we would now be used to – an approach that pays dividends in the luscious string sound in the Adagio. Munch is ideally suited to the playful finale. The two Beethoven symphonies are also very successful, particularly the 5th, where Munch's driving momentum is strengthened not undermined by flexible tempi. The performance of Schumann's 2nd is very memorable. Anyone interested in the history of conducting should think seriously about this set. It documents a powerful and exciting performer in a relatively unfamiliar repertoire. There are highs and lows, but from a purely musical point of view some of the performances are stand-outs. I would certainly encourage buying the set, but all of the DVDs are available separately and if funds are limited then I would recommend DVD 1 (Beethoven), followed by DVD 4 (Schubert and Schumann).